There was one post published in November 2011. Two months between posts is really not acceptable. It is not as if I have a shortage of un-remarked-on pieces of stationery. On the other hand it is a huge cliché of infrequent bloggers that they pop up to say how awful they are for not having made an entry, and then don’t make any entries for the next year, so I’d best not do that. Whoops! Here are two of the inks. The other two were Graphite – a greyish green – and Wild Strawberry – yet another red. I have no idea why I keep buying red inks, but I think that I have more of them than I have blues, which is another colour that I pretty much never use. I have made these scans at 300 DPI, but note that, on the page, in anything less than intense direct sunlight, the inks seem much darker than they do here. One of the frustrations of writing about ink, rather than with ink, is that photographs and scans just never properly demonstrate what the ink looks like. Photographs are mostly too dark, except in the best of light, and it is quite late here at the moment. Scans are always too bright. It’s a tragic injustice if you ask me. This is another dark ink, though not quite as dark as the Eclipse, and also blue instead of purple. It is not amazingly muted but is not a bright blue, and perhaps leans towards the indigo end. 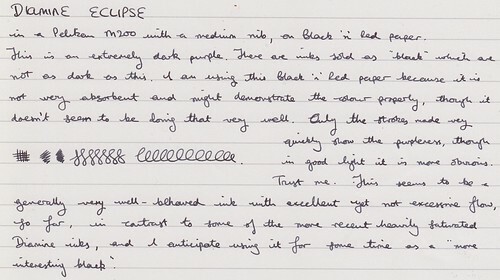 Again, like the Eclipse it is very well-behaved and a lovely practical writing ink. I used both of these inks in this years aborted NaNoWriMo and produced thousands of words with both without having any smearing or flow issues. With blue inks I either like them to be quite dark and low colour saturation (J Herbin Bleu Nuit, R&K Salix) or absurdly bright (Bay State Blue, Waterman South Seas Blue). Denim falls into the former category. I think that it behaves better than the Bleu Nuit and is also a better colour, slightly darker – I would do you a colour comparison but unfortunately my bottle of Bleu Nuit fell to the dread plague of SITB1, and I am unwilling to load up a pen with Quorn. As a note, I have been a bit annoyed with some of Diamine’s “New Century” highly-saturated2 inks which take forever to dry and don’t even have the justification of some of the Noodler’s inks that they can survive in volcanoes. 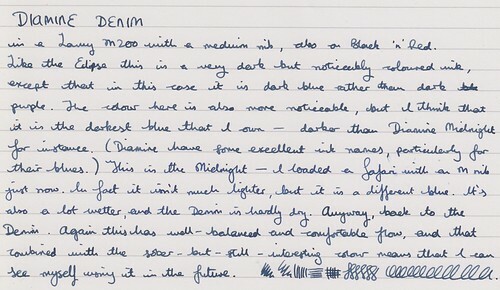 If you, too, have been annoyed by this, you will be happy with both the Eclipse and the Denim, which are both proper shading inks with distinctive colour that actually dry in less than a minute. They are not waterproof, but then, you could always not spill water on your writing. I have increased respect for water-soluble inks after knocking over a bottle of Herbin Eclat De Saphir on Sunday which splashed all over the carpet of my rented flat. Not that it has disappeared, but it is gradually disappearing, with the application of water, paper towels and swear-words. Where can I buy these wonderful inks? Well, I am glad you asked me that. You can order them directly from Diamine in either little 30ml plastic bottles (which I prefer to test things) or big Art Deco 80ml glass ones by going to the Diamine inks site. It is not the nicest-looking site in the world, but it works. For foreign types, I believe that some other sites do distribute Diamine inks and may charge you less in postage.